As I mentioned before, randomly-generated dungeons simply aren’t enough to ensure replay value. As I’ve indicated, Diablo has its shortcomings relying on randomly-generated combat encounters and dungeons. It does some things right, but those things can only take a game so far. In my mind, Persona 3 did a pretty good job of mixing things up with a number of different elements that were both random and fixed. 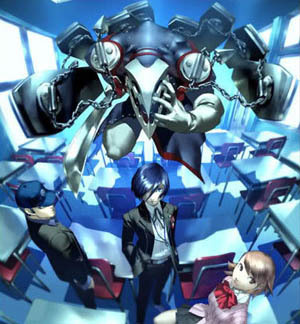 In Persona 3, you had the school year to contend with, which advanced the plot along with the school year whether you were ready or not. In some ways, this was great for keeping the game moving forward, though a few hours level-grinding in Tartarus could easily make you forget about a test you had to take the next day. I liked that Persona 3 had a mixture of combat- and non-combat scenarios for you to engage in, and that many of them were controlled by the player. You always had to go to school, but when that was over, you could talk to any of the Social Links available at the right time and place, and advance the Social Link in question. One of the things I think spoiled the Persona 3 experience was how advancement in the dungeon was tied to the calendar. You were held back until you played through certain events, though despite choosing what order in which to engage some Social Link events, there wasn’t a whole lot for you to actually control outside of Tartarus. Bosses you defeated in Tartarus were gone, and you advanced your character and personae, fused new personae, acquired money, and found treasures. My thought was that a combination approach, where it was possible to say, choose your class schedule, maybe even your teachers, complete basic repetitive tasks like homework and exams to “level up” your character’s academic abilities (similar to combat encounters), alongside combat advancement, would be a fun dynamic. Finally, there was the problem with Persona 3’s mystery being, I don’t know, solvable. Once you reached the end, you knew the story. You could relive your memory of the story, attempt the Social Links in a different order, carry over some of your progress, but the school year would proceed exactly the same. You would face the same enemies on the same floors, fuse the same personae, and fight the same boss monsters on the same days of the month. I think Persona 3 (and Persona 4, by that same token) has an important piece of the puzzle that incorporates both combat- and non-combat situations for the player to overcome.